Regular readers of Irish Genealogy News will remember that, back in early March, FindMyPast released their 'enhanced' indexes to the General Register Office's births and marriages registers on IrishGenealogy.ie. As my original blogpost relates, the collections were launched with limited information about the records they contained, and it was soon clear to most people who used them, that the indexes were not complete. It was Genealogist John Grenham who spent time to work through the indexes in May to find that the records of 58 registration districts were missing - see his blogpost FindMyPast’s unmarked elephant traps. 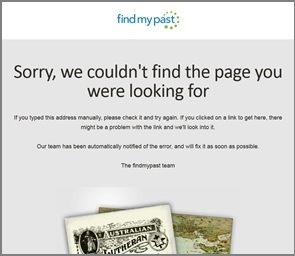 Around the middle of June I noticed the two indexes had quietly been removed from FindMyPast. I had rather a lot on at the time and I'm sorry to say that I completely forgot to update this blog about it. In fact, it went right out of my head until last weekend. Apologies. Let's hope that when the indexes return they will be complete, and with a researcher-friendly explanation of their contents.